Sift flour, xanthan gum, and powdered sugar into a large mixing bowl. Stir to combine. Mix in almond flour and orange zest, make a well in the center of the bowl. Beat egg whites until soft peaks starts to form. Add almond essence and orange juice. Pour into the well with the melted butter. Fold gently together to combine. 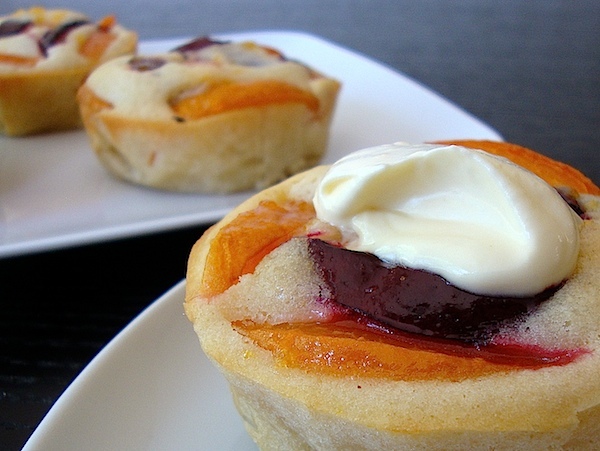 Pour into a prepared 12 cup muffin pan (about 3/4 full) or small ramekins. Arrange fruit on top. Bake for 20-30 minutes or until baked and golden brown. Remove from the oven. Let stand for about 5 minutes before you remove onto a serving plate. Serve warm with ice cream and fresh whipped cream. These are so pretty! I love that you bake healthy and substitute to create mouthwatering treats!! Just found your blog thru your guest post. Thank you!! Apricot is a favorite of mine too! They're in season for us so they are really sweet! Mia, These little gems look wonderful! We just to thank y'all for linking up to Our Country Pot Luck! We hope you will bring by your favorite dishes every other week to our get together! Thank you so much!! I am excited to be a part of your link party.